Who doesn’t love the idea of a second home – a place on the water to get away from it all, to relax with family and enjoy nature’s soothing qualities? But if you can afford a second home financially, can you justify it environmentally? The fossil fuels used to run a building and make the four-hour commute to a recreational home are pure luxury from an environmental perspective. This house on Colpoy’s Bay, built by the husband and wife architectural team of MJ | architecture, represents a way around that. 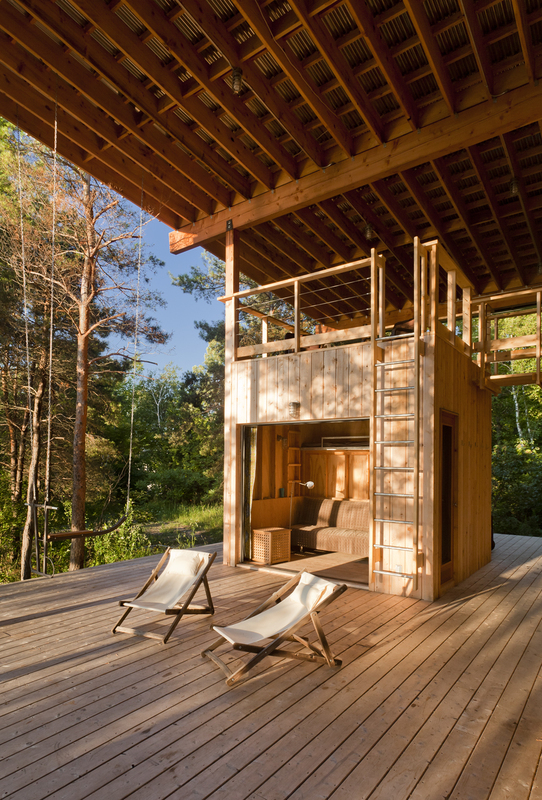 “We wanted to see if we could make it net zero carbon neutral, that’s how we justified a vacation home,” says Melana Janzen (the M in MJ | architecture). How do you build a carbon neutral home, you ask? Janzen describes it best. “Optimized passive heating, cooling and ventilation is achieved using south facing glazed areas, large roof overhangs, wood-burning heat, and Energy Star heat recovery ventilators and appliances. Further contributions include a large photovoltaic array feeding back into the electrical grid along with a strategy to employ an efficient infrastructure of water, sewage and electrical systems. Build all that on a former gravel pit and your environmental conscience can rest easy. But if you want to go one step further, then you divide it all by two. The owners don’t just include Melana Janzen and John McMinn (with two children, Soren and Annika), but also their friends Karina Inzunza and Graham Barker. The two couples bought the property originally planning to build a couple of bunkies. But as many who have built their own dream homes discover, the government’s regulations got in the way. So the idea of sharing a building emerged. The building is an assembly of four discrete enclosures linked by an expansive deck and roof. The two interiors are 650 square feet each, but in the summer, the decks open the living space up to 2200 square feet. Two 10 by 10 bunkies offer additional living space. To top it all off the home is set up to charge electric vehicles meaning sometime soon, even the commute for the Torontonians will be environmentally friendly. MJ | architecture believes this is the future of residential building and hopes to share the lessons they’ve learned. “This project is beginning to disseminate information on how to create recreational properties that do not add to the environmental load,” says Janzen. And that’s something we all can aspire to.